Sales of large SUVs in Europe are rebounding from a year-long decline, with sales up 28% in the first half of 2015. Only one of the 6 carryover models shows a decrease, the others are all enjoying double digit growth. The Hyundai Santa Fe is under threat from its family member Kia Sorento, thanks to that model’s all-new generation. The Sorento already outsold the Santa Fe in April and June and its 70% year-over-year increase compared to the outgoing model places it less than 10% off the segment pole position, even with the Santa Fe adding a still impressive 37%. 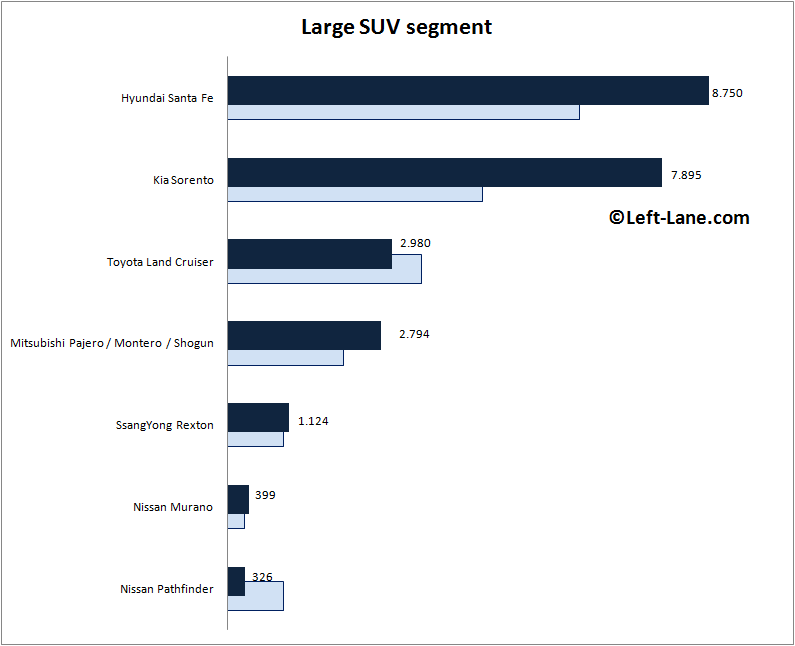 The Korean siblings are the two fastest growing models in the segment, and together they held a whopping 71% share of the large SUV class in Q2, up from 66% in Q1 and 58% last year. The Toyota Land Cruiser reclaims the third position of the segment it lost to the Mitsubishi Pajero in Q1, despite being the only model in the class to lose volume on last year. The SsangYong Rexton follows at a distance, with the Nissan Murano even further behind. The new generation Murano is in showrooms now, but the outgoing model’s controversial styling has proven much less popular in Europe than it has in the US and the new model isn’t exactly a wallflower either. For that matter, I have higher expectations of the Ford Edge, which should start deliveries within a few months.